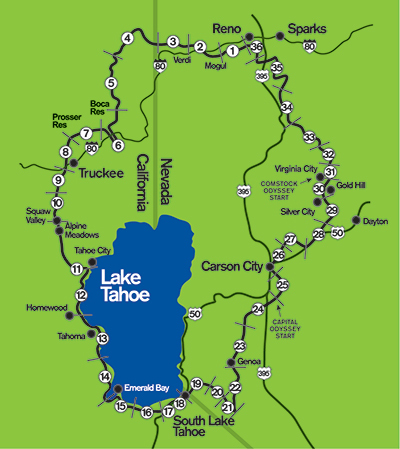 The Reno-Tahoe Odyssey course is like no other, given the combination of natural scenery, world class attractions and historical points of interest. It is a physical and mental challenge for all runners, yet at the same time it’s a fair course. The course begins in Wingfield Park, an island park in the middle of the Truckee River in Downtown Reno. This is also the location of Reno’s Truckee River Whitewater Park. The runners travel the loop course in a counter-clockwise direction. The course ends in Idlewild Park, another park along the Truckee River just minutes to the west from Downtown Reno.